Some organizations have a knack for attracting the most talented candidates. 1. An appealing brand. The company establishes a clear identity that’s distinctive and helps it stand out in the marketplace. 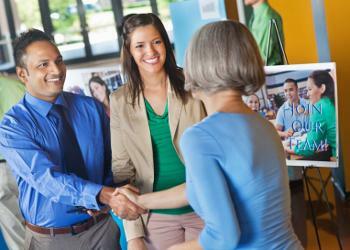 Prospective employees buy into the brand and want to associate themselves with it. The best brands are built around quality and reliability. Organ­­i­­zations with a reputation for excellence and a willingness to invest in professional development and advancement of its workforce tend to draw the most interest from top candidates. 2. A compelling purpose. Companies that articulate in plain English what they do and why it matters attract like-minded employees. People who understand their employer’s purpose—and believe in it—place greater value in their job. 3. An exciting growth opportunity. The best jobs offer more than a paycheck. There’s the promise of training to master complex skills, grappling with intellectually stimulating challenges and gaining access to cutting-edge technology or a uniquely rewarding work environment. Compare your workplace to competitors and find ways to dangle more opportunities that others cannot match. At Trader Joe’s, for example, a store opening can draw 500 applicants for a few dozen openings. The grocery chain boasts a popular brand, a meaningful purpose (to sell healthy and distinctive products at low prices) and a fun, festive retail environment where employees proudly wear the store’s Hawaiian shirts as a cool, funky badge of honor. — Adapted from Talent Magnetism, Roberta Chinsky Matuson, Nicholas Brealey Publishing.